So I managed to squeeze some time into my Sunday and stopped by to see how the Old Timers were doing at Game Vault this past weekend. I know, the post title says Thursday, we meet on every other Sunday, but it's a long story and I'd rather not try and explain the whole thing. It was nice to see what the fellas have been up to and see what everyone was working on. I snapped a few pics of some models that caught my attention this week and wanted to share them here. Our resident IG player took the time to paint the inside of his Valkyrie cockpits. That's right, plural... he has two of them like this. Don't I feel like a slug now. I never paint the insides of any vehicles. I glue hatch doors shut when I can and even skip priming the insides if I can get away with it. I came close to painting the inside of a cockpit once with my Eldar Vypers, but that was only a "glow" from the instrument panel so I only needed to use one color. Even when I go the extra distance on my models, I do it on the cheap. The next two are Necron related and the one above is a Necron Catacomb Command Barge I think. He's painted it up like I painted his other vehicle using a drybrush method to get it done relatively quick. Looks good and with a little more work, it will make for a nice centerpiece vehicle for his Lord to travel in style. This next one is perhaps my favorite. 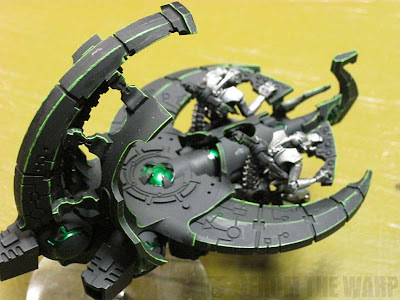 It's some version of a Necron flyer that a model doesn't exist for yet. He's got the bones down so far and is planning on adding more to it when he gets more time. I think this thing just looks so cool. He's even got it mounted on a flying stand. Make sure to check out the other Old Timer Articles! 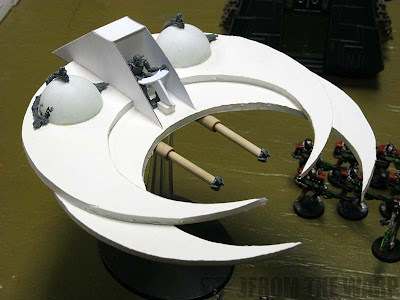 Wow, that Necron flier looks like it really has potential. I love me some scratch built vehicles! 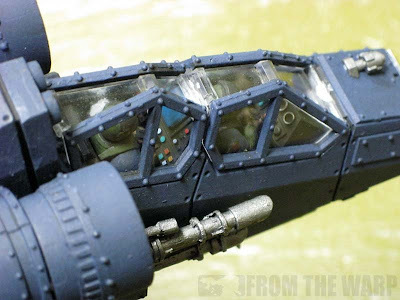 I've painted the cockpits on mine too, but when gluing them down the CYA glue "fogs up" and ruins the transparency from the inside out. :( I'd love to know what others do to prevent this from happening on their canopies. When it came time to glue the canopy down on this, I was very conservative with where I applied it. I think I applied it to only 4 points as small dots using Model Master cement glue's needle like spout. I don't know if that was the secret but it worked for me. Krisken: Scratchbuilt vehicles just have a certain feeling to them. It can make for a nice change sometimes. uniteallaction: Thanks for the comment, I've got you added in the third blogroll already. #2501: I found the trick of using white (PVA) glue to keep the cockpit from frosting over like that. If you're careful enough and you make sure to wipe all your fingerprints off the plastic beforehand, you can use superglue, but only in the tiniest amounts. The superglue usually reacts with the oils left on the model from your skin and gives the frosted look. @ Ron & #2501: I magnetised my valk cockpit by putting tiny steel pins in the grey plastic parts and little rare earth magnets in the hull. Other than that for clear canopies I usually use 2-part epoxy with a colouring agent mixed in. You can use the powders used for colouring resin, or weathering powders in a pinch, if you are looking for a particular colour. Specifically I try to match whatever colour is my darkest so that the joins look like part of the highlighting process (i.e. the joins are shaded). Da_Sub: Now there's a method I haven't heard of, but it sounds like it would work fairly well. I have a friend who magnetized his cockpits as well and he says that's the way to go when it comes to transporting them.